Back in May, I wrote a blog post for Philly Marketing Labs giving you 5 Reasons to Boost Your Marketing with In-Person Events. 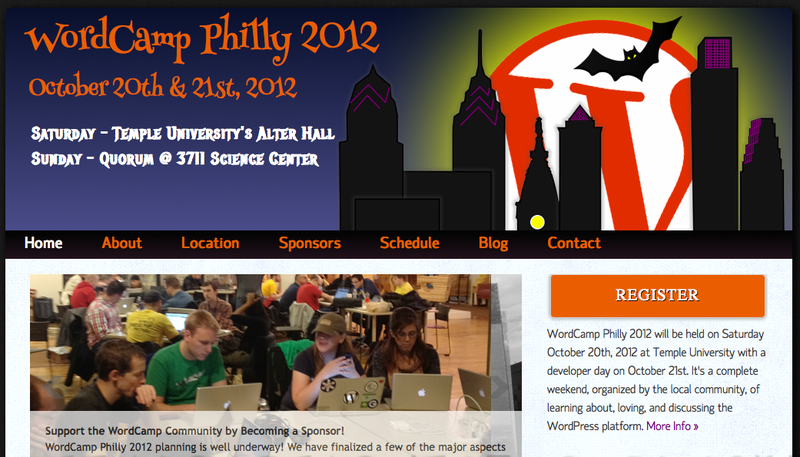 Now, after attending WordCamp Philly, I have some more information for you on how to run a great event. Instead of trying to force my recollections of the event into a list of tips for you, I’ll tell you the three basic things they did right and then give you a host of specifics from the event that will hopefully give you fantastic ideas for your own event. They had fun and made sure their audience did too. They thought of their audience every step of the way. Website – WordCamp is an event about WordPress, so, obviously, there was a website set up for the event. Check it out for yourself. Notice how nice and easy it is to find the “Register” button. I can’t tell you how many times I’ve seen that not be the case. Emails – The day before WordCamp began, we attendees received two emails—a “Packing for WordCamp” list and parking information. Plus, the organizers listed ways we could contact them with questions—through Twitter or email. Perfect! Just as I was thinking, “Hmm, what should I bring tomorrow,” the answer arrived in my inbox. If only life ran that well. Price – The price of this event could not be beat. I paid $20 for an all-day event jammed full of useful information. And, guess what? I received a fun t-shirt with that as well. I walked in Alter Hall at Temple University having never been there before. As soon as I walked in, it was obvious where to go. I was greeted by a table full of volunteers who gave me my badge and directions for the day in a snap. And then, I was off to a delicious breakfast bar, which alone was worth at least half of the $20 admission price. Because we were issued a name badge that doubled as a nice little booklet containing a wifi password, a map to all the rooms and a list of all the sessions, I felt very comfortable that I had all I needed. The day kicked off with official open remarks, which included a damn good WordPress rap. That’s right, I said rap. We hadn’t even hit session one and everybody was already engaged. No restrictions though. You could go to any session you wanted, no matter what track you chose. We were told before the sessions that if we weren’t thrilled with the content or had thought the session would be a bit different, we could get up and go into any other session. Because we had a badge full of details on what sessions were going on when, this was easy to do. Presenters – In the sessions, the presenters were dressed in Halloween costumes (and had a chance to win an iPad for coming in costume). 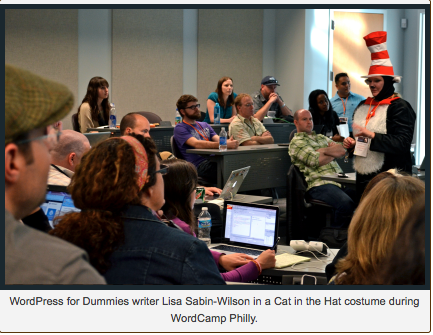 Lisa Sabin-Wilson, whom you might know as the author of WordPress for Dummies, dressed as the Cat in the Hat (photo and caption above borrowed from Technically Philly), and…wait for it…gave her presentation, “Oh, the Themes You’ll Do,” in a Seuss-like rhyme! Oh, how I wish that session I didn’t miss! Swing by his website and check out his 10 People I Met or Got to Know Better at WordCamp Philly. On top of all this goodness so far, there was even a Happiness Bar (no, don’t let your mind drift to the gutter), where anyone could go to ask questions of any presenter on any WordPress topic and get help that fit their own personal needs—WordPress-related needs, of course. Saturday night, all attendees were invited to celebrate at a local bar. I hear it was a great night. Unfortunately, I could only stay through lunch. But I can say that even as a newbie to the whole WordPress scene, I really wish I could’ve stayed. The group was so welcoming and so much fun, I enjoyed myself and can’t wait for next year’s. Sunday, for “Dev Day,” Matt Mullenweg, the founder of WordPress showed up. That shows the quality of Philly WordCamp right there—that the founder of WordPress took time to pop in and talk with everyone. Totally unadvertised and, it seemed, at least mostly unplanned. If you were on Twitter that day, you may have seen the excitement around his surprise appearance. Classy, for sure. Also, one last fantastic thing about this event was that later that week, most of the presentations were posted on the Philly WordCamp website. 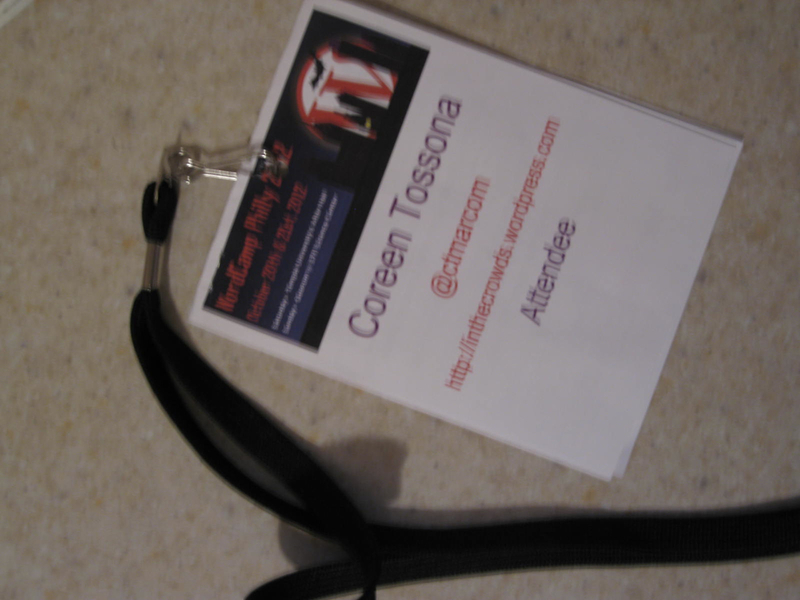 Now I (and you) can check out the presentations I didn’t get to see. 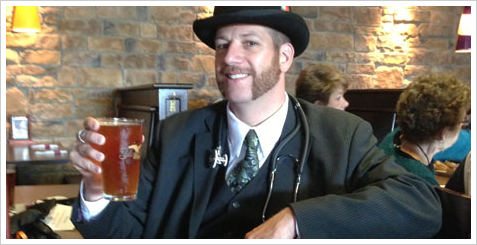 Hopefully, by now, you see how great of an event this was and how fabulous your own next event can be. Learn from the best and the worst of what you see around you. Put on an event you would want to pay to attend. I hope you are already brimming with ideas that spring off of the creativity shown by Philly WordCamp. Good luck!